This is a shot I popped yesterday morning while in a school of Stripers. We had been banging them for 45 minutes and this was the first chance to take a pic of what we were working. Lately I have been using my Navionics map to keep me on contours that the Stripers are holding on. I have shaded the map with blue being 0 to 20 feet and also 40 feet and above. This allows me to keep in the 21 to 40 foot range where we have been catching the fish lately. In the mornings the fish have been very close to the transition from around 20 feet then as it gets brighter they have tended to move deeper. I took this shot looking for Stripers. I had been cruising about 20 mph on the left side of my echo screen and saw a bunch of Stripers then slowed down to investigate. The Striprs at speed show up as dark colored "blobs" but as I slow down they turn into arches with color in the middle. I keep my colorline where all the keeper fish show some dark redish brown in them and the punks simply show yellow. This allows me to keep my sensitivity up while running but enables me to distinguish keeper fish. Also in this screen shot while chirping you can clearly see a Striper right in the middle of a school of herring. When I noticed that I immediately cut the big motor off, touched the screen over the school of bait, deployed the trolling motor, went directly to the waypoint and spanked the Stripers. 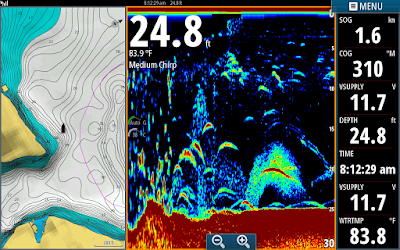 Notice how clear the screenshot is on this Simrad. How sweet it is to have technology like this and know how to take advantage of it. This is the time of year Anthony and myself [Navico Pro Staff] sell our units to make room for our new ones. 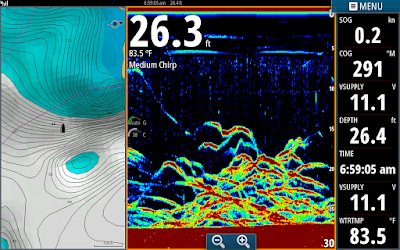 We have sold two of our Lowrance's and have a month to sell one more Lowrance and two NSS EVO 2 12 inch touch units. These are units I take my pics on and use daily. They are under warranty and guaranteed to put you on fish. They also come with a introductory demo to educate you on how to use them. They are so user friendly it doesn't take but a few minutes to feel comfortable with them. I can be reached at Jim_Hemby@hotmail.com . Check out all the Simrad products at Greentop Sporting Goods.